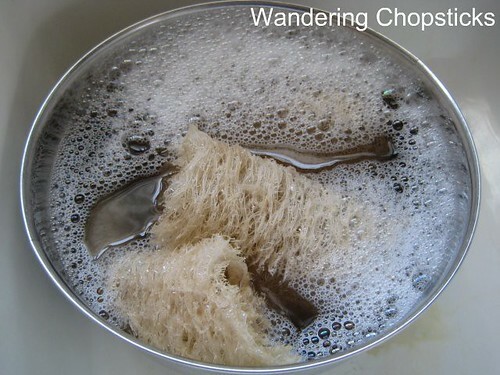 I've given you a recipe for Muop Tom Xao (Vietnamese Loofah and Shrimp Stir-Fry) so I figured it was time I showed you how to make your own loofah sponge. 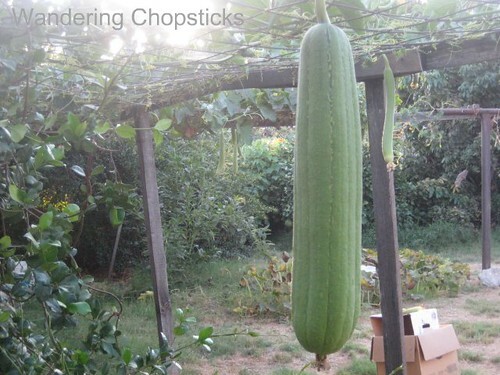 My second-youngest uncle's muop (Vietnamese loofah) growing on the vine. He always leaves one big one to dry out so he can get the seeds to plant for next year. 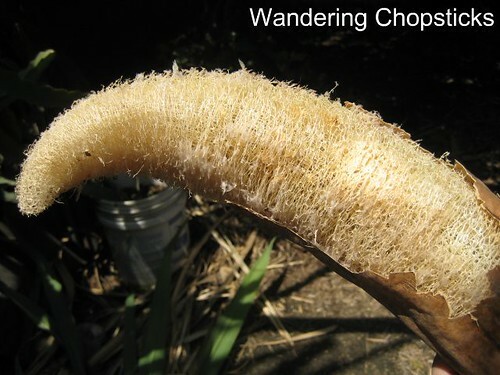 So while I was chopping down some sugarcane months ago, I spied a loofah that had dried out. This is what it looked like last year in my youngest uncle's loofah on the vine. He's growing the angled loofah this year so I'll have to take photos to show you the difference. This is a different loofah from a few months back to show you how hard and brittle the outside gets when it dries out. 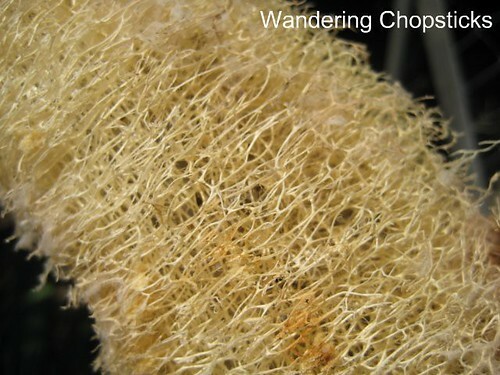 You must use an old, dried out loofah in which the fibers have formed. 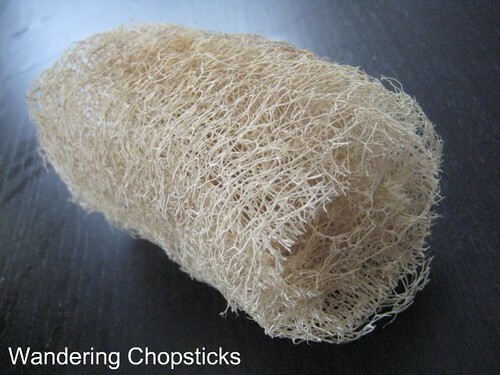 Loofahs are generally cut before the fibers form so that they're easier for eating. 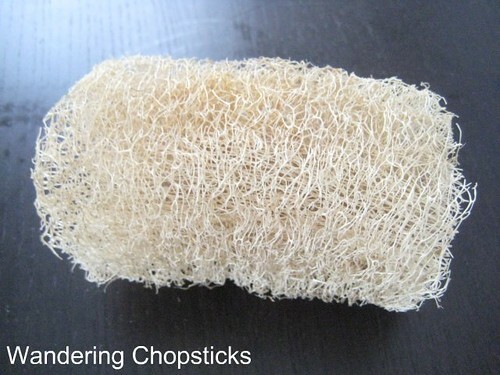 A cut loofah from the store may not have grown fibrous enough and if you leave it out, you'll simply get mush. When that happens, you can just peel off the outer layer. To reveal the inside part that we use to scrub in the shower. My uncles use loofah sponges to wash their dishes too. See? That's what it would have looked like if it had still remained on the vine. It's not quite ready to go yet. You'll have to shake out all the seeds and cut the loofah into thirds, or however large you want each section to be. Save the seeds to plant next year's crop. Soak the loofah sections into warm soapy water. Use a little bit of bleach if you're concerned about cleanliness. I scrubbed and rinsed the loofah until the dirt was gone. Let them dry out again and you have cleaned loofah ready for use in the shower or kitchen. And there you have it, how to make your own loofah sponge. 1 year ago today, thanh long (Vietnamese dragon fruit) in my youngest uncle's garden. There's always something amazing and unusual to be found here! Very cool shots showing the beginnings of a loofah sponge! My Vietnamese tutor's dad grows these, and she brought me a huge one - easily 30 inches long! It's a completely smooth variety. She gave me a recipe to make, as well but I'm going to let it dry out - hopefully it doesn't rot before it dries out. I was a little unsure how to get the "sponge" once it had dried, so this post is a great help! They kinda look like shredded wheat. And I also had no idea whatsoever that you could eat loofah. How long do they usually last when used as a dish sponge/body scrubber? I don't think I've seen loofahs around. Does it go by any other name? It just goes by loofah and its usually found under gourds in gardening catalogs. Pretty neat stuff. I am always in aw of nature. I am sorry I forgot that they are spelled different here in the states but pronounced the same: Luffa is a genus The are in the cucumber (Cucurbitaceae) family. This reminds me so much of my grandma. She used to have those. I haven't seen one in years. 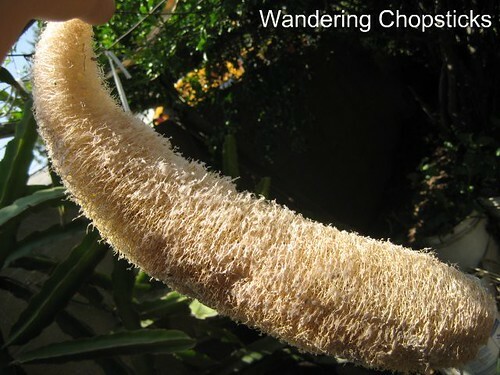 wow... i never knew how a loofah plant looks like. thanks for sharing... very interesting! First time poster, long time reader. :) I've never seen this type of loofah before with the outside so smooth. I've only seen the angled kind and it's such a pain to peel! Makes me cook it less often than I'd like. Do you see the smooth kind in stores anywhere? Luffa is synonymous with sponge gourd, right? TS, I think you have seen this, locally, we call it "patola." There are two kinds, the angled one, which we are more familiar with and this smooth oblong variety. You are better than a Vietnamese version of a CBS Survivor Winner + Martha Stewart. I love how you share you knowledge with us. 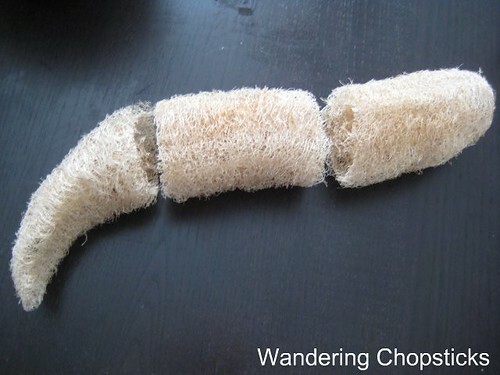 Thanks for the loofah how-to! That's so cool! I had no idea where loofah came from. I thought it was from the sea... Now that I look at it, I have a picture of me and my sister when we were very young, holding the squash (?) in our arms in Cali! I've used Loofah's before but never even thought about where they came from. I'm wondering it it's something you can only grow in hot weather? I would eat it. If they gave it to you, it's meant for eating. So the fibers haven't formed yet. Leaving it out will only cause it to rot. If you let it dry out thoroughly between uses, the loofah sponge can last months and months. Haha. Yeah, I guess if you saw the cut up portion in stores, you wouldn't think it was a natural product. In English, I only know of loofah, sometimes spelled luffa. I didn't know Brazilians had loofah too. I've always thought of it as an Asian plant. Thanks! Try stretching your green thumb this way huh? I've see the smooth kind in Asian grocery stores. Maybe you never noticed it before? That's nothing. The winter squash get bigger. And my parents once grew an opo squash that was more than 5 feet long. Ha! Funny you mentioned MacGyver. Once on a camping trip when we didn't have a grill, I cleaned off a brick and balanced it on rocks and that's how we cooked our burgers. It does sort of resemble sea sponges. Perfectly reasonable to think it comes from the sea. Maybe. My parents grew other squash in Oregon but never loofahs. Although you could certainly try. Tamarind. Hmm. Hard outer peel. The shape and size are so different I've never thought of making that comparison. Yup. Before blogging, I used to overlook a whole lot of things just because they weren't in my radar. WOW! I love it! In China, we saw so many families growing these. Not so much here in the U.S.
You are right, it is an Asian plant, but did you know that there is A LOT of Asians in Brazil? Mostly Japanese, it's the largest Japanese comunity outside of Japan. Great pictures! The trellis looks great. That's been my main downfall. I need much much larger and stronger structure, like your uncle's. Haha. People have been doing it for years and years. I'm just showing how. I think building a proper trellis is the hardest part. These plants can get pretty heavy. I never knew muop was a loofah! Now you do. Lots of people apparently didn't know either. 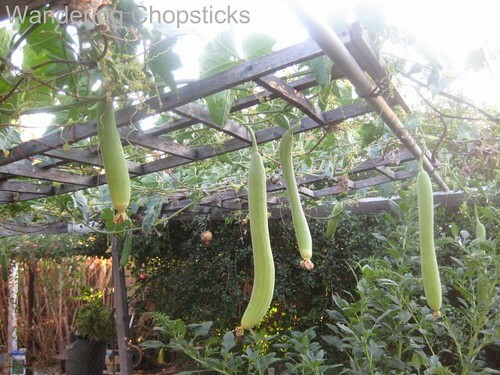 I have luffa plants with long "fruit" that I was leaving to dry on the vines. But several of them rotted, so I cut down the rest. The skins aren't brown and wrinkly yet, and a couple have small rot spots forming. How can I dry them without losing them to rot? Any help you can give would be appreciated! This was a gardening project with my young grandchildren, so I don't want it to fail. I'm sorry I'm not of much help there. Soooooo cool! Love the tutorial! 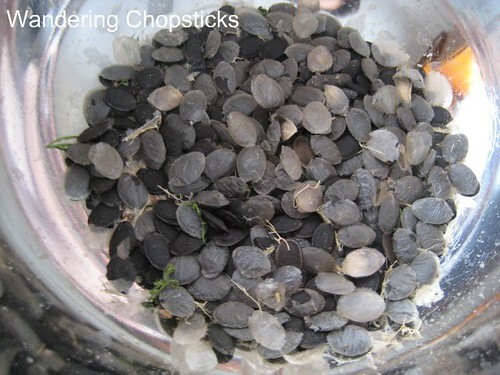 I ordered some seeds to try to grow these! Hope you have fun growing them. my mother plant this since we were young, we just dont know the "process"(soaking in a warm, soap, and bleach)to be able to produce a "presentable" loofa scrubber in order to sell in the market. By providing these, I will try next time i will go home.. I hope someone will post what kind of bleach i can use..
Just ordinary bleach, the kind used to clean and for laundry will do. It helps to disinfect the loofah. 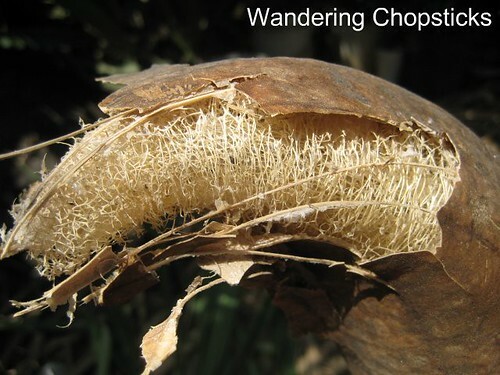 Curious where you get could loofah seeds to start a crop and what type of a growing season they need. This would be fun! 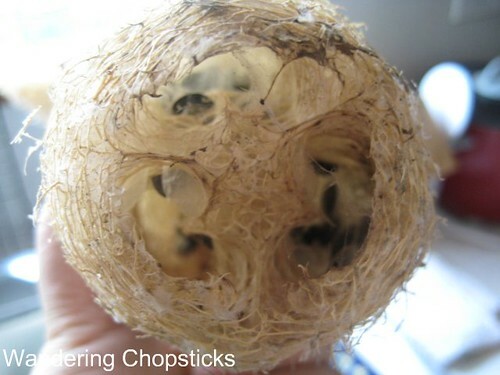 There are some Asian vegetable seed companies that sell online. You can just shake the seeds out. Really! 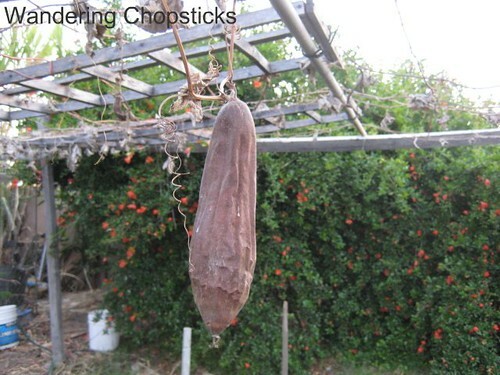 By the time the loofah is that dry, just hold it over a bowl and shake and the seeds will fall out easily.